Sustainable building (also known as “green” or “earth-friendly” building) is an idea which has been growing in popularity in recent years. Some people are drawn to sustainability by a desire to reduce their impact upon the earth. Others are attracted because of concerns about rising energy prices and fuel bills. Still others are concerned about how the built environment affects their health. Sustainability as it relates to buildings has to do with reducing the negative impacts of our buildings by minimizing their use of energy, water and other scarce or non-renewable materials; reducing waste, and avoiding the use of toxic materials inside and outside the home. Sustainable design requires a systems approach from the beginning of the design process - considering how the different parts of a building work together. It is not a feature or two that are tacked on after the design is complete. Many strategies to sustainable building add nothing to the initial cost of construction; others cost more up front but pay the owner back in energy savings over time. Some may never pay for themselves monetarily but can result in a sense of satisfaction for the building owners that they are lessening their impact on their environment. Regardless of your level of interest in sustainable building, I can work with you to determine strategies that fit within your budget. I try to “walk the talk” in my own business by minimizing the amount of paper that I use and the amount of driving that I do, by minimizing my energy use and by buying electricity produced by “green” sources. I regularly look for ways to lessen my impact on the earth. 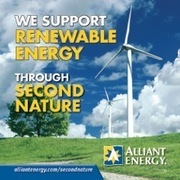 I am a member of the Midwest Renewable Energy Association and since 2005 have been a participant at the 100% Earth Steward level in Alliant Energy’s Second Nature renewable energy program .